Ottawa, one of Canada’s largest cities, has 950,000 people. Now, imagine this whole population struggling to work good jobs and live comfortably. This is a harsh reality for the over 900,000 Ontarians living with disabilities. Fortunately, with more funding and assistance flowing to families and agencies, the reality is improving. Today, on the International Day of Persons with Disabilities, OASIS is recognizing the Ministry of Community and Social Services’ efforts to end the wait for Ontario’s families in line for social assistance. Ten-year-old Thomas Bourke is excited to ride his bike and play on the sprawling 11 acres of greenspace when he moves with his mom into their new Burnhamthorpe and Mill roads area condo in late November. But first, the family is seeking some angels. The 1,300-square-foot condo needs extensive modifications to accommodate Thomas, who has cerebral palsy. He requires assistance in all mobility and daily living skills, and has difficulty speaking and processing information. A group that represents people with cognitive disabilities wants its members to have access to Para Transpo services. According to current rules, anyone who wants a ride with Para Transpo must have a physical disability. But the Ottawa-Carleton Association for Persons with Developmental Disabilities says some of its members struggle to use regular city buses. 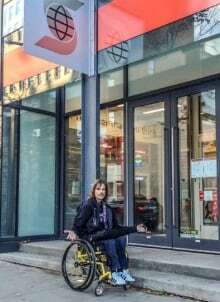 As of writing this article, that’s how long it will take before Ontario is legally required to be fully accessible under the Accessibility for Ontarians with Disabilities Act.